Joey Belladonna is the lead singer for the seminal NY thrash band Anthrax. Media Mikes caught up with Joey at this year’s Mayhem Festival where we talked about how the crowds have changed over the year and the bands recent work on several cover songs. Adam Lawton: What has been the best experience so far on this summer’s tour? Joey Belladonna: I would have to say the new kids. We are running in to a whole lot of different fans. There are young people, old people, new fans and old fans. It’s been really great. The whole atmosphere of this tour has been quite a bit different. It has a carnival like feel to it but it’s still a heavy metal/rock show. AL: How have shows like Mayhem changed from the band first started playing on them to now? JB: I think the buzz has started to pick up more. People have started taking notice that we as a band are still strong and better than ever. We aren’t a manufactured something that is just out here for nothing. We don’t mess around and the new material live is brutal. AL: How did you go about making the set list for this run of shows? JB: The real hard part was covering are catalog in 40 minutes. We have some songs that are pretty long. We had to try a few different things to fit in to that time frame. I think we have done pretty well touching on all aspects of our music. Sadly there is just no winning if someone wants to hear a specific song but I think we did the best we could with the allotted time. AL: Can you give us any updates about the cover album that has been in the works? JB: There have been some songs recorded but I can’t tell you much more than that. I haven’t really started doing vocal tracks for it yet. Things are still sort of lingering with what will become of it and if deadlines can be met. AL: What are the plans for Anthrax after the Mayhem Festival wraps up? JB: We will be hitting Canada and some portions of the U.S. That will take us through mid October. Then we will be back out with Testament and Death Angel for the third time around. Starting in November we will be out with Motorhead in Europe as the support act. That should be pretty cool. 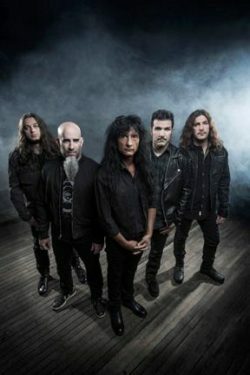 AL: Anthrax did a lot of recording at the legendary Pyramid Studios in Ithaca, NY. What is your take on what’s happening with the city trying to destroy that building/business? JB: Alex was out and saw us the other night. It awful what is happening with that situation. I can’t even imagine being told one day that you have to move out of your house because it’s supposedly unsafe. I didn’t really know what to say when we were discussing it. I passed along some info and I hope everything works out. Dan Spitz is best known as one of the founding member of the thrash metal group Anthrax. Together with Dave Mustaine of Megadeth, Dan has put together a new band called Red Lamb. The band is set to release a new video in the coming months and Media Mikes had the chance recently to talk with Dan about the project and the premise behind it. Adam Lawton: Can you tell us about your new band Red Lamb? Dan Spitz: Red Lamb is the first thing I have ever done full bore outside of Anthrax. I am charging forward with this project the same way I did with Anthrax. We are trying to break new ground as there is a purpose behind this band. Because of that purpose the music its self took a long time to create and get its sound. This music is different from my past but still reminiscent of me. This was a fresh start for me. This is a collaborative effort between me and Dave Dave Mustaine of Megadeth. He came in one day to hear what I was doing and really took hold of it. This is I think the first thing he has ever done outside of Megadeth. He really wanted to be a band member more than a co-producer or co-lyricist. Dave known’s my family so he has sort of a personal stake in this material. He knows the purpose of the band. AL: Can you elaborate more on the purpose behind the band? DS: Around the world we have a problem with Autism. Previous generations saw Autism however it wasn’t in every neighborhood. It’s now infiltrating everywhere. My wife and I have identical twin boys who are both Autistic. There is a song on the album titled “Puzzle Box” which will be are next release that we just finished a video for. I hope to change the world through music by bringing awareness around the world that this is a serious problem. We aren’t asking for people to send us money to give to a certain charity. We want to just bring awareness around the world. The CDC just released a statistic that 1 in 56 boys born with have autism. That is crazy! What will we do when everyone grows up and can’t function in a normal job? We pull no punches and I am living this hear every day with my kids. That’s what Red Lamb is here to do. Once the machine roles we will be doing something on a permanent basis. AL: What will be the actual premise of the video? DS: The “Puzzle Box” video is really going to be like a mini movie. Our singer Donny is a video producer so I was kind of blessed to have him in the band. He was able to take my idea and show what we live each day as a family. We are going to show to the world what it is like to live with Autism. My family are all in this video. We also filmed at the Autism Speaks walk. We filmed all kinds of important people and things that will be included in the video. I am not here preaching but everyone needs to just wake up. If you look on Facebook people are writing in about how they are affected by Autism. It’s a really moving video. There are people in the movie and sports industry that have been standing up for Autism for years but there has never been anyone in music that has done anything. People often wonder why it has taken me so long after leaving Anthrax to do something new. Now people will get to see what goes on in my house on a regular basis. Every 30 seconds there is a crisis going on. To write and record is very difficult. Eventually I had to leave and live at Dave’s studio to be able to finish work on this project. Things are that hard where I had to completely remove myself. It’s time everyone see’s what’s going on. AL: What can you tell us about your work on the film “Goat”? AL: What other stuff do you have going on right now? DS: At this point I do plan on doing a bunch of things. Red Lamb is taking up most of my time right now. Once this video is done and out then the object is to go out and play. It will be time. We started a little while ago putting things together so I can get back on the stage. I have been away for awhile so it will be great to get back to where I belong. I took some time off from music to clear my head and during that time I realized what I was here to do. I’m back doing it and I don’t plan to stop. I also am currently working of some stuff with Chris Vrenna from Marilyn Manson which is turning out really cool.